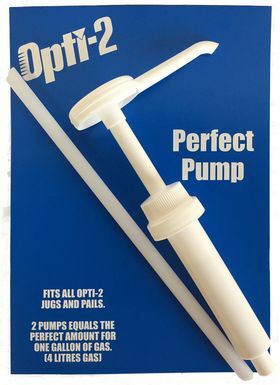 Opti-2 Perfect Pump fits both the gallon jug (#20044) and pail (#20015). Just add two pumps per gallon of fuel. The Perfect Pump has been tested to over 2000 pumps with no noticeable wear and without losing its prime, even when left idle for 30 days! Clean, no sticky measuring cup.